Posted May 27, 2013 by Nate Beaty & filed under News. Spudnik Press’ Residency Program provides the resources, equipment, and space for one artist per season to develop a body of print-based work. We hope to encourage and enable the production of high quality prints, and to contribute to the development of an emerging Chicago artist. 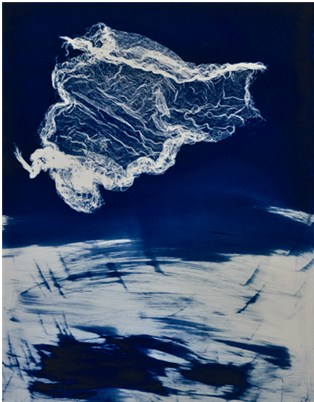 Veronica Siehl’s print and drawing work employs repetitive mark making; she creates texture, furry bits and visual noise. She intentionally addresses the surface – marking, cloaking or interfering – so that the viewer might question what lies just beneath. At the heart of her work lies a curiosity with the idea of identity and a fascination with all the “stuff” that individuals are made up and out of; by what it means to be. Veronica investigates and works with shadow – as subject, medium and metaphor. Shadows defy time in their ability to simultaneously be present and absent. According to Jungian psychology, the shadow is our subconscious; it is what we have hidden. In addition to acknowledging this archetype, Veronica views the shadow as a reminder of the many faces individuals wear openly. Through explorations with shadow, mark making, time and space she explores places which are un-mappable, feelings that are unnameable, and instances that might otherwise be forgotten. In working with letterpress and cyanotype processes paired with poetry at Spudnik, Veronica aims to pay homage to the emotions that transcend our daily lives and take on a life of their own. Through employing shadow and repetition (in writing & process) she will explore themes of potential and loss, nature & nurture and the evolution/progression of the individual. Download the application for complete details. ← Publishing Projects at Spudnik Press!